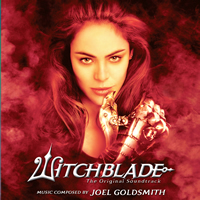 TV Series WITCHBLADE starring Yancy Butler with music by the late Joel Goldsmith. Witchblade premiered in June of 2001. Despite only airing for two seasons, Witchblade became a cult favorite. Based on the comic book, the show starred Yancy Butler as Sara "Pez" Pezzini, who while investigating the murder of her childhood friend, comes in contact with an ancient gauntlet, which melds onto her wrist and protects her from harm -- forever changing her destiny. It is the Witchblade, an ancient weapon that heightens her powers of perception and transforms into a formidable sword that is one with its wearer. With an arsenal of amazing powers -- and a mind of its own -- the Witchblade is both a blessing and a curse. Now Sara must learn its secrets in order to master its mystery before it masters her. "I remember mixes where I'd sometimes be hearing Joel's music for the first time," described the series' Executive Producer Ralph Hemecker, "and I'd be utterly blown out by how he infused the shows with a sublime, mystical aura that actually became a huge part of the storytelling." The son of composer Jerry Goldsmith, composer Joel Goldsmith's film scoring career began in 1983 scoring the Steve Martin comedy The Man With Two Brains. An expert with the synthesizer, early in his career, Joel spent much time assisting his father on scores including, Logan's run, The Reincarnation of Peter Proud and Jerry's first all-electronic score for Runaway, while scoring episodic TV. Joel Goldsmith's sound proved a perfect match for the science fiction/fantasy genre and led to his work on such films as Kull the Conqueror, Man's Best Friend, The New Untouchables, The Outer Limits and the Stargate Television franchise.